Not tanks or marching columns, but books will be paraded at the historic Red Square in a novel celebration of The Year of Literature. Families, with children, are expected to flock to the first ever book fair being organised at the iconic site between June 25 and 28. Organisers have come up with a novel way to celebrate the Year of Literature. 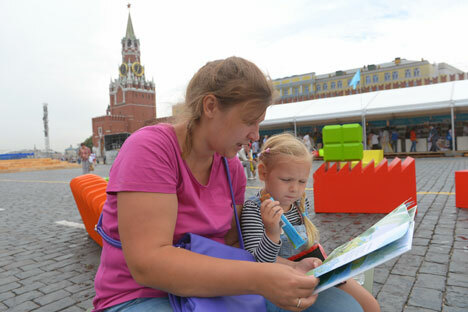 They have chosen the iconic Red Square as the venue for the literary festival, ‘The Books of Russia.’ For the first time ever, Red Square will witness a parade of books and authors and eager readers flocking to browse through thousands of books on view there. More than 300 publishing houses from across Russia will showcase their newest and best editions; ranging from fiction to education to literature. The festival will occupy more than 250,000 square feet of space, from the State History Museum almost up to St. Basil’s Cathedral. The fair will be divided into thematic zones. The central focus area will be a book market, divided by genres, flanked by a stage and a lecture podium, where events like talks and reading with and by famous authors and literary performances will be held. There will be four interactive zones at the book fair; fiction, children’s literature, non-fiction and library; at which visitors can buy souvenirs, watch films, meet with authors or just relax. During the four days of the festival, different zones will host meetings with writers and poets, including Zakhar Prilepin, Vladimir Pozner, Pavel Basinsky, Eugene Vodolazkin, Mikhail Veller, and Alexander Kabakov. Actors and musicians including Alexey Garibol, Yury Bashmet and Denis Matsuyev will perform for guests of the festival. The budget for the festival is 40 million rubles ($730,000), said Mikhail Seslavinsky, head of The Russian Federal Agency for Press and Mass Communications. "When we came up with the idea of the festival, none of the publishers believed it was possible," said Vladimir Grigoriev, deputy head of the agency. "The most important thing is that the festival can go on from here and be held on Pushkin's birthday on June 6. We also hope that next year the festival may become international."